No matter what Mel Kiper Jr tells you, the Buffalo Bills are the biggest losers of the 2018 NFL Draft. Sure, they made some good picks, but trading up to get Josh Allen is going to set their franchise back. I had a blog post in mind slamming Josh Allen but never got around to it…this one did a helluva job though. There is absolutely no statistical track record for a player like him panning out. His completion percentage in college was no good and while he has all the physical gifts in the world, he does not have a brain. He does not process the game fast enough to be an NFL quarterback. ON TOP OF THIS, the Bills offensive line is trash and their wide receivers are brutal. So you’re taking a project QB and throwing him to the wolves with no help. Good call, everyone. Tremaine Edmunds and Harrison Phillips are two good picks, no way around it and even my hate for Josh Allen will not change my mind. 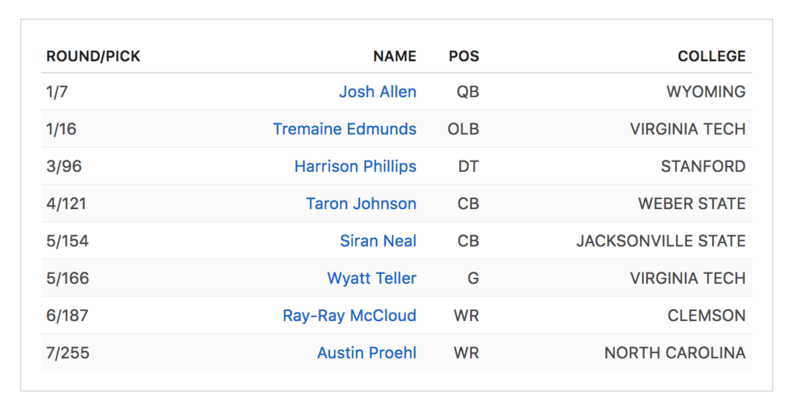 The rest of their draft is full of meh and the fact that they drafted Josh Allen means this had absolutely no hope. If they were throwing him into a situation with a rock solid offensive line and some talented wide receivers then maybe I would not be so hard on them. Or if he had an elite QB to learn from. But, nope, he’s got AJ McCarron. There’s almost no scenario where this is not a total debacle. I actually feel bad for Russell Wilson, truly I do. I liked Rashaad Penny in college but when he got picked in the first round I actually said “no way” out loud…could not actually believe it happened. He’s not good in pass protection and drafting a running back in the first round hardly fills their biggest hole. Sure he was productive, but I do not see how he warranted a first round pick. 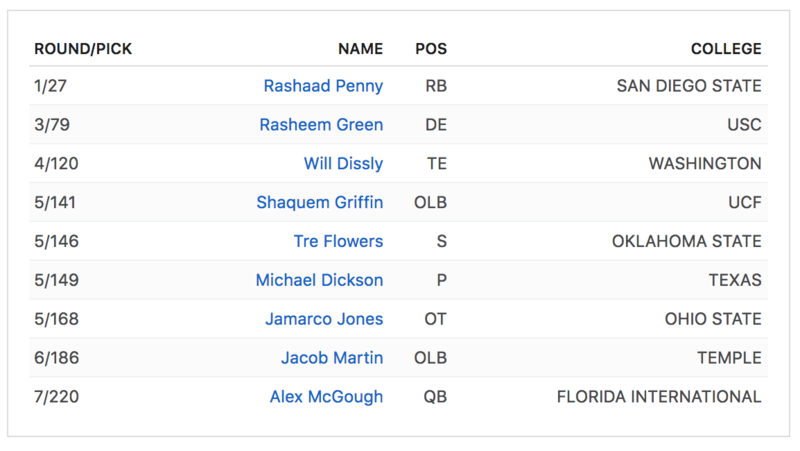 Rasheem Green is a nice pick and Shaquem Griffin is a good story…but drafting a punter (no matter how good he is) before addressing your offensive line is absolutely brutal. A lot of times I feel like the Seahawks are trying to be too smart for their own good or they think they’re so much smarter than everyone else because they crushed the 2010 and 2012 drafts and they took Richard Sherman in the 5th round in 2011. The truth is, they have been an absolutely brutal team when it comes to drafting the past decade and it has not changed. Until they figure out that they have to fix their offensive line, I’m not sure they’ll ever get back to the playoffs. As awesome as their draft was last year, this draft could be that bad. Trading a future 1st round pick to move up and draft a project DE when you’re in win-now mode is a highly-questionable decision. Rick Leonard is also one of the worst tackles in Florida State history and the rest of their picks are average players at best at the moment. Tre’Quan Smith is a depth receiver with a low ceiling and that’s not quite what you want in the 3rd round. If Marcus Davenport develops to be as good as people are hyping him up to be, then it might be worth it. But I know that Ziggy Ansah is not currently worth two first round picks and that seems to be the popular comparison for Davenport solely because he’s a project too. I went back and forth whether or not to put the Colts on here quite a few times and obviously I decided to. Quenton Nelson is a stud and could very well be the best non-QB in this entire draft. But taking a guard that early is a tough move in terms of positional value. Then they spent three of their 2nd round picks on players that I am not even close to a fan of. Tyquan Lewis is real solid, but Kemoko Turay is wildly inconsistent and I’m not just saying that because he went to Rutgers. I’m not sold on Darius Leonard or Braden Smith and when you have four 2nd round picks, you MUST hit on all of them, especially when you have one of the worst rosters in the entire league like the Colts do. 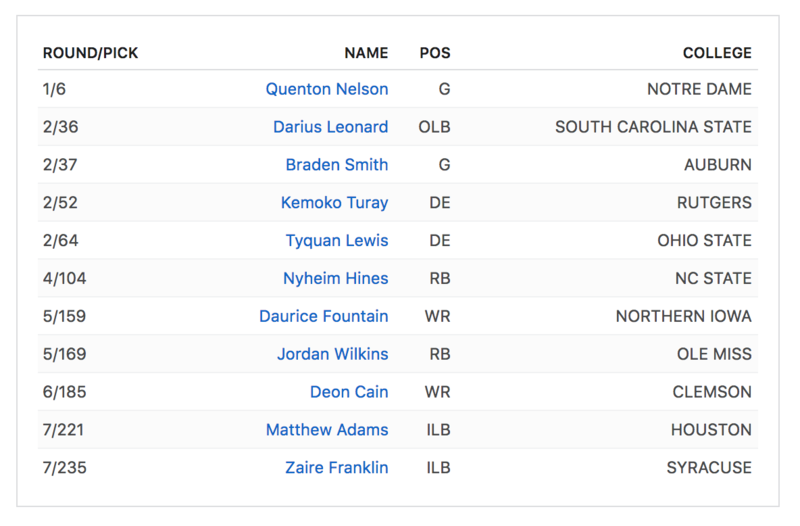 The Colts did a good job later with their next four picks taking some serious playmakers in Hines, Fountain, Wilkins and Cain…the two receivers are a great combo in my opinion. If Andrew Luck is healthy, maybe this team could actually do something but the fact he has not started throwing yet is an even bigger issue than their 2nd round picks. 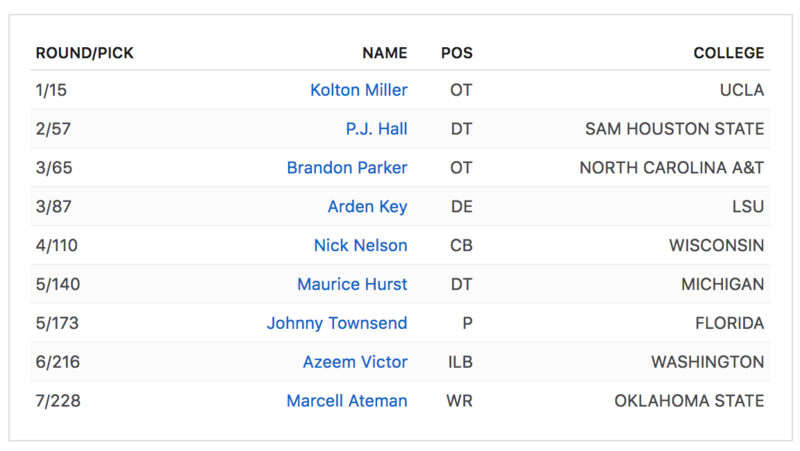 I might be cheating a little bit here including another boom or bust draft, but I could not toss a draft with Arden Key and Maurice Hurst into the losers category. If Key and Hurst stay out of trouble and stay healthy (respectively), they could be the two biggest value picks in the entire draft. Kolton Miller is a project and P.J. Hall is an intriguing small school guy, but neither one really inspires a ton of confidence right away. Brandon Parker was the first player taken that I had no clue who he was and then the Raiders followed it up by drafted Nick Nelson (who tore his knee up working out for the Lions) and a punter. I like the Ateman pick but a 7th round receiver hardly makes up for some of the choices they made early in the Draft. If Key and Hurst pan out, this draft will be a success. But if either one, or god forbid both, fail then this first draft under Jon Gruden could end up going extremely poorly. This entry was posted in NFL and tagged 2018 NFL Draft Losers, Arden Key, Braden Smith, Brandon Parker, Buffalo Bills, Darius Leonard, Harrison Phillips, Indianapolis Colts, Josh Allen, Kemoko Turay, Kolton Miller, Marcell Ateman, Marcus Davenport, Maurice Hurst, New Orleans Saints, Nick Nelson, Oakland Raiders, P.J. Hall, Quenton Nelson, Rashaad Penny, Rasheem Green, Rick Leonard, Seattle Seahawks, Shaquem Griffin, Tre'Quan Smith, Tremaine Edmonds, Tyquan Lewis. Bookmark the permalink.